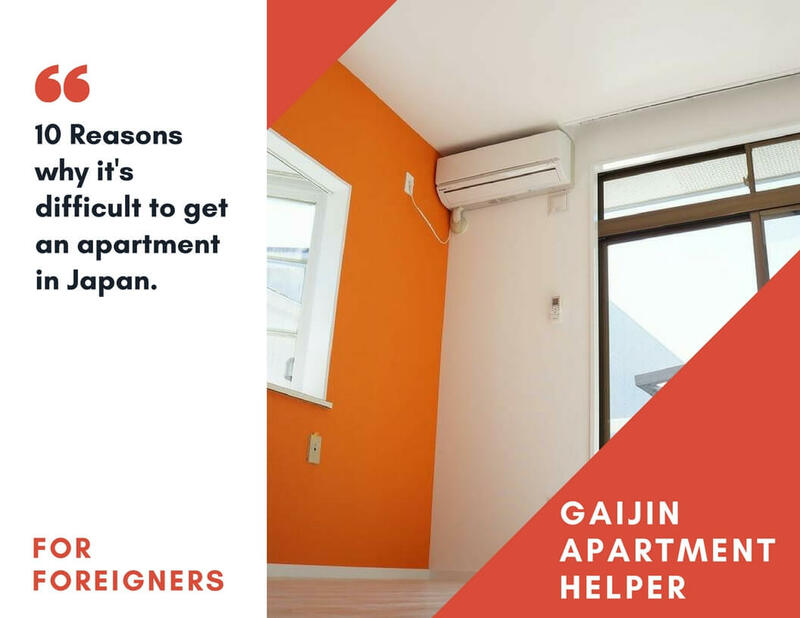 Receiving an apartment in Japan as a foreigner can be very difficult if you do not have the proper guidance or know how. There are many things that you should know before you start to hunt for your new apartment. Here are to top 10 reasons why it's difficult for foreigners to receive apartments in Japan. The number one reason why it is difficult for foreigners to rent in Japan. Is that owners or management companies do not allow foreigners into their properties. Some realtors will tell you that only 10-20% of apartments in Japan will allow foreigners. Of course this percentage goes up with higher populated areas. For example in central Tokyo about more than half of apartments will allow foreigners. We have also found that owners that are more elderly are more hesitant of accepting foreigners as well. More than half of the apartments in Japan require a guarantor which is a cosigner. A guarantor in Japan must be a Japanese citizen and is willing to take responsibility for the rent to be paid. Most Japanese will rely on their parents to be their guarantor. This can be very difficult for a foreigner however to find somebody willing to take this huge responsibility for them. Learn more by visiting our article on guarantors. Language can also be an issue. If an owner or management company feels language will be an issue they will be more hesitant to accept your application. However most apartments that allows foreigners will let your emergency contact help you through this issue. Some owners and management companies have experience with foreigners leaving the country without paying off what they owe. This can result with them painting us with the same brush. Meaning that they put most or all foreigners in the same category without seeing us as individuals. Another reason it's more difficult for foreigners to receive apartments in Japan. Is that owners feel that foreigners will not follow the rules. Some people have not been properly explained the rules to them. For example trash pick up and so on. This results in the owners considering the other tenants that live there and what they think. Not being accepted for this reasons is a bit of a rare thing in urban areas but it can still happen. Again this is something that they paint us with the same brush and is considered not fare as an individual. If you go through a normal Japanese realtor and not a foreigner friendly one. It is possible that you can be denied service or treated unfairly. Walking into a realtor shop and being denied service is not uncommon. The main reason for this is that it is more difficult to find apartments for foreigners. Especially if they have little experience in doing so. Also if you have not done your homework or are inexperienced in receiving an apartment in Japan. If the realtor is not honest it is much easier for them to hide fees form the initial payment. The average initial cost in Japan is five times the rent. The most hated fee would be key money. Most people consider this to be overwhelming and a bit ridiculous. However it is possible to find apartments with a more affordable initial payment. A good deal for the initial cost is considered anything that is three times the rent or lower. The process of receiving an apartment in Japan can be very difficult and confusing if you do not have the proper guidance. It's not Just finding an apartment and signing the contract. The whole process usually takes one week from signing an application to receiving your keys. In some cases it will take up to 10 days or more. To apply for an apartment you will need a residence card and a Japanese phone number. Also in some cases you will have to see the property in person before applying for it. If you came here on a holiday visa and it is limited to one year without renewal. It will be much more difficult for you. The reason is usually once you found an apartment your visa will not be for a full year anymore. Because it is impossible to stay there for a complete year. It will be more difficult to be accepted. However there are some ways around this. If you have a good realtor he can try to simply find you an owner that can accept you. However it will not be easy. You also can receive a short term lease which is paid month to month. The last option is to receive a room in a share house. If you are planning to stay in Japan for a year or longer. Getting an apartment from overseas is something that you should definitely consider avoiding. The main reason is that most apartments that have a one year lease or more will not allowed this. To get a normal apartment in Japan you'll have to have your residence card and also provide a Japanese phone number. Also some apartments will not allow you to apply for it until you have seen it in person. Most of the time the only way you can receive an apartment from overseas is by renting out a short term apartment. Short term contracts have less requirements which will allow you to apply for it form overseas. However short term properties are usually much more expensive. The best way to handle this is to know which apartments you would like to go see before your arrival. Then set up an Airbnb for your first 10 days. Here at Gaijin apartment helper we help you through the whole process every step of the way. Please do not hesitate to contact us for help.